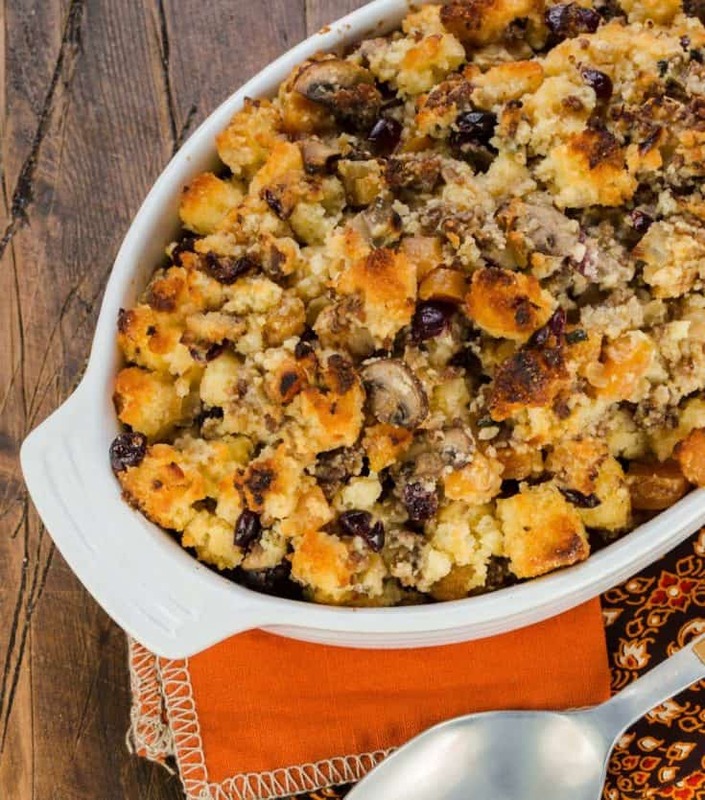 My mama made this Cornbread Stuffing with Sausage and Dried Fruit last Thanksgiving, and I went back for thirds. THIRDS. Yes, it’s truly that good, and if you’re one of those folks who likes to add a little variety to your traditional turkey day spread, this is the dish for you. I cut up a large loaf of fresh cornbread for this recipe (about 18 ounces or 8 cups of cubes). Many stuffing recipes call for stale bread cubes, but fresh bread actually works really well in this dish. 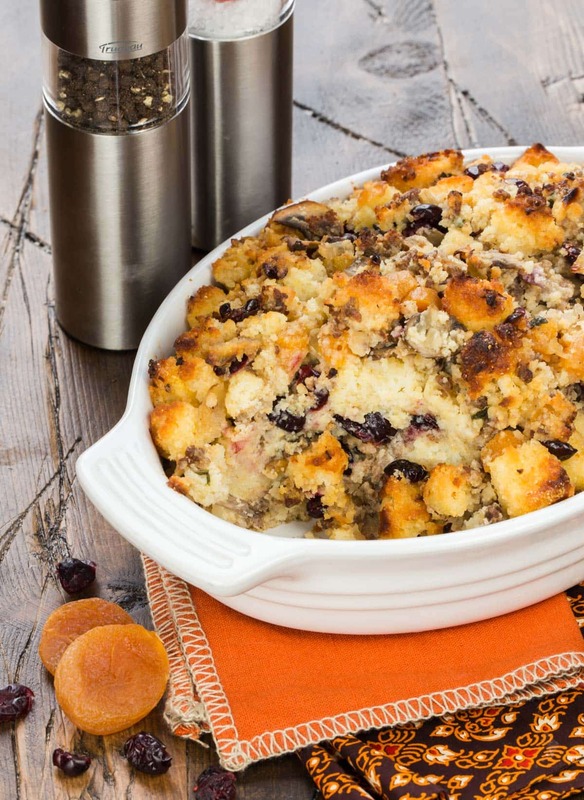 The cornbread provides a coarser, heartier texture to the stuffing while the sweet dried apricots and cranberries are offset by the savory sausage crumbles and sautéed onions. This dish can easily be prepped the morning of your meal, covered and refrigerated until ready to bake, which is perfect for major cooking days like Thanksgiving. For all of you purists out there, I did title this recipe as stuffing, but it technically is “dressing” because it’s cooked outside the bird. I don’t care what you call it as long as you save all the crispy edges for me. Tip: Check your stuffing at 30 minutes. If it’s browning too quickly, cover with foil for remaining bake time. 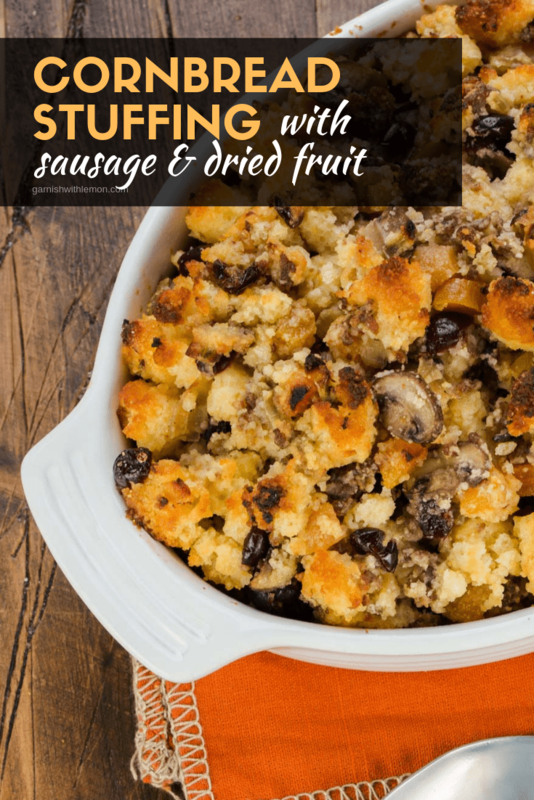 A savory stuffing filled with sausage and fruit. Grease a 3 quart baking dish. Set aside. Heat oil in a large skillet over medium high heat. Add sausage; cook until no longer pink. Add onions, mushrooms, crushed red pepper, brown sugar and sage to the pan. Stir together and cook until onion is translucent. Remove from heat. Stir in dried fruits and 1/2 cup broth. Cool to room temperature so fruits can absorb some of the broth, at least 30 minutes. Add remaining 1 cup broth and cornbread to skillet and stir to combine. Pour stuffing into prepared baking dish. Bake for 45 minutes. Check the stuffing after 30 minutes. If it is browning too quickly, cover with foil for remaining baking time.